Please submit your application with your appraisal demo by the application deadline listed above. Mya Sadler, ASFMRA Director of Education and Accreditation is available to assist you with questions at msadler@asfmra.org or (303) 692-1224. Approximately one half of all land found within the United States is utilized in some form of agricultural production and even more is included in uses such as rural residential and recreational properties. At the same time, the number of appraisers that have been educated and trained in this specific type of real estate is relatively small as a percentage of the entire appraisal workforce. As a result, appraisers in this industry have formed a very close network of peers which aids in the ability to gather significant factual data pertinent to very difficult and complex real property issues. Given the complexities of issues surround such a large percentage of real estate throughout the United States, and the significant investment required by market participants to acquire ownership, a well trained and experienced valuation professional has vast opportunities to obtain significant business. Five years of experience appraisal experience. Experience must include at least 600 hours of the 1,600 hours in each of the last three years in rural appraisal. For the purpose of determining work experience, each applicant will be asked to submit six appraisal reports from their log. 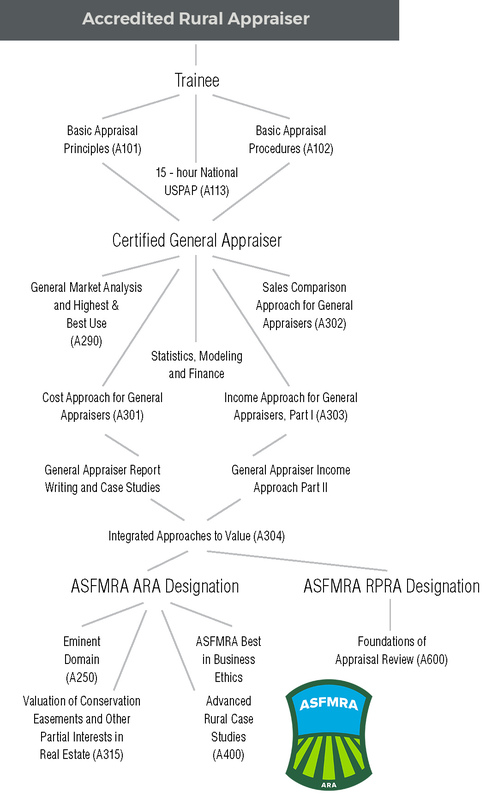 Provide evidence of certification as a Certified General Appraiser under the certification laws and regulations of any state, if the applicant of the designation works within the United States. *While it is recommended that you take or challenge A304 Integrated Approaches to Value, if you have taken all of these courses – A110, A200 and A300, you will not be required to take A304 to be able to sit for the ARA exam. However, you must have taken all three courses to get the exemption for A304.